Verizon has begun training their employees on the the much anticipated Samsung Galaxy Nexus. 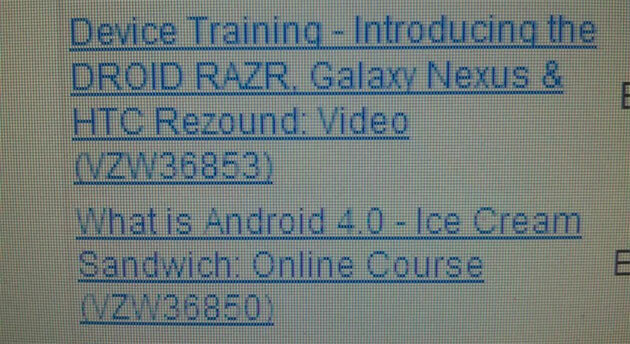 As you can see from the image above, Verizon is offering a crash course on Ice Cream Sandwich along with the Galaxy Nexus, HTC Rezound and the recently released DROID RAZR. When training beings it usually means we will be seeing the device soon, perhaps in the next two weeks? While Verizon has remained mum on the Nexus, we have already seen accessories arrive at various locations. It shouldn’t be long now, what have you been doing to pass the time?